States have consistenty failed to protect water resources from toxic coal ash. But the U.S. House of Representatives just passed a bill to prevent the EPA from doing anything about it. This afternoon, the U.S. House of Representatives passed H.R. 2218, a bill that strips the U.S. Environmental Protection Agency’s ability to regulate coal ash. The bill fails to protect human health and the environment from the unsafe disposal of toxic coal ash waste. 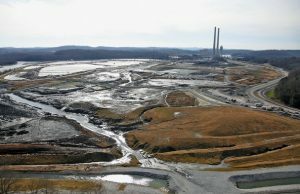 The bill’s supporters, led by bill author Rep. David McKinley (R-WV), continue to claim that the bill provides “minimum federal standards” while keeping states in the driver’s seat in regulating coal ash disposal. They even claim that states know best, and have done a good job so far. This is most certainly not the case, and state failures are well documented. The bill’s true purpose is to stop the EPA from classifying coal ash as a hazardous material and implementing federal regulations to govern its disposal. Rep. John Shimkus (R-IL) repeatedly said of amendments that increased EPA oversight of state programs that they would “undercut” the purpose of the bill. In other words, the bill was not passed to ensure the safety of coal ash disposal sites or to protect human health and the environment. The only thing it accomplishes is stopping the EPA from creating a rule that the coal and utility industries would not like. We will now turn to the U.S. Senate and work to ensure that it does not take up the bill, but instead supports the EPA’s authority and mandate to protect human health and the environment with enforceable federal standards. AV's Senior Legislative Representative, Thom spends his days between Durham, NC and Washington D.C., knee deep in politics and legislation, working to persuade decision-makers to protect Appalachian communities from mountaintop removal and to invest in a new economy for the region. He is the least outdoorsy person at Appalachian Voices, and he's just fine with that.